FIM 2005 World Endurance Championship Series The Coca Cola Suzuka 8-Hour Endurance Road Race Report on the Participating Yamaha Teams - News Releases | Yamaha Motor Co., Ltd.
Yamaha Motor Co., Ltd. (YMC) is proud to announce the make-up of the Yamaha teams that will compete in the Coca Cola Suzuka 8-Hour Endurance Road Race of the FIM 2005 World Endurance Championship Series, to be held at the Suzuka Circuit in Mie Prefecture, Japan on July 31. Three teams, including the top team and two support teams, will compete in the JSB1000 class of this race with an endurance spec YZF-R1. The top Yamaha team will be the YSP Racing Team sponsored by PRESTO Corporation. The first rider for this team will be Shinichi Nakatomi, who competed for the same team in the 2003 Suzuka 8-Hour and won the JSB1000 class championship while finishing 2nd overall. He and the team will be trying for a second class win as well as the overall victory. The team's second rider will be selected from among the currently competing Yamaha teams. 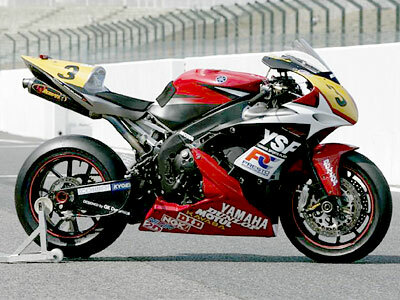 Formed in 2002, the YSP Racing Team sponsored by PRESTO Corporation is managed by the YSP Members Club user organization of the nationwide YSP (Yamaha Sports Plaza) sports bike retail franchise with main sponsorship from PRESTO Corporation, a domestic distributor of primarily overseas Yamaha motorcycle products. The team is now entering its fourth year of competition. On June 12, the team will enter the "Road to 8-hours Suzuka 300 km Endurance Road Race" in preparation for the 8-hour race in July. Next, Team Cha-llenger will be entering as a Yamaha support team for the second consecutive year. With the Yamaha Motor group company Soqi Inc. as its parent organization, this team and is now in its fifth year. The team also receives support from various companies of the city of Kakegawa, where the Soqi headquarters are located and the city of Numazu, where its factory is located. The team name combines the Japanese character for tea (cha), a famous product of the area, and the word "challenge" so strongly associated with Yamaha. The team has recorded a best finish of 5th at the Suzuka 8-Hour in 2002. The riders will be selected from among the currently competing Yamaha teams. The second support team will be "Club Yamaha Motorcycle RT." This is a team organized by the "Iwata Racing Family" (IRF) and is made up completely of Yamaha Motor Company employees, from the riders and mechanics to the helpers. This will be the team's ninth time competing in the Suzuka 8-Hour, and in the past it has finished as high as 9th overall while winning XF class in 2002. As in the last two years, the team will represent all Yamaha users with cooperation from the Yamaha motorcycle owners' support program "Club Yamaha Motorcycle." Club Yamaha Motorcycle is an organization engaged in a number of activities aimed at promoting motorsports, like organizing riding schools and training sessions. Because these activities share the same philosophy of community-rooted sports promotion as the Jubilo Iwata professional soccer team based in the same city as the Iwata Racing Family, the Club Yamaha Motorcycle RT race machine for the Suzuka 8-Hour will have the same sky blue ("saxe blue") coloring as the Jubilo Iwata team uniforms beginning this year, as an expression of its desire to promote a further spread of motor sports in the area. Riders will be chosen from among the Iwata Racing Family members. This marks the second time that a team will enter the Suzuka 8-Hour with the Jubilo Iwata blue coloring, following the 2000 entry by "Iwata Tombo RT Jubilo." Born: Oct. 30, 1978 (26) in Fukuoka Pref. Cooperating sponsors of "YSP Racing Team sponsored by PRESTO Corporation"